Bulk Silica Gels are highly-porous, solid materials, used to remove humidity, and are therefore known as drying agent or “desiccant”. We sell it in pre-bagged sachets (see SuperDryPak™) and we also sell it in bulk quantities. The main use for the bulk format is to fill (or re-fill) desiccant towers, breathers, and dryers. 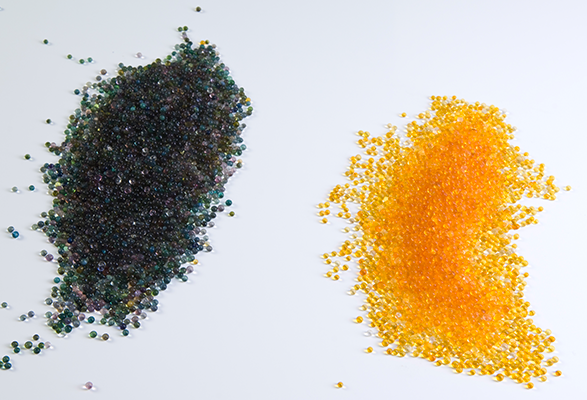 Our silica gel come in two main forms, Beaded or Granular. The main advantages of the beaded form is that it is cheaper, generates less dust, and creates less back-pressure in air-flow pipework. While the main advantage of the granular form is that it packs-down into a more compact format. Thus, it’s far better suited to applications where space is limited. TransformaGel™ is our brand name for OG-B gels, and they are commonly used in the Electricity Transmission; above all in the Distribution sector for the re-filling of Desiccant Breathers on Electricity Sub-Stations. We supply Bulk Silica Gels in 25Kg lots – packed either in hermetically-sealed sacks, or rigid drums (with re-closable lids). For help with your desiccation requirements or any other problems that you have, please give us a call on +44 (0)1628 531900.